Restaurants & Reservations: Dining in Cincinnati: Red: Steaks and Wine. The name says it all. Red: Steaks and Wine. The name says it all. Red is one of those special occasion restaurants where most of us just can’t afford to be regulars. Fortunately for us, we recently had such an occasion, and so we thought we’d share our visit to Red with our readers. The name “Red” says it all--this restaurant is about steaks and wine with a few other dishes in case a non-red-meat-eater happens to be dragged there. But like most high-end steakhouses, Red isn’t just about the food and drink--the service, decor, and atmosphere are also outstanding. Entering Red in Hyde Park Square, the first thing we noticed was that the restaurant is unusually dark. The lights are low and much of the decor is a deep red color, which gives the restaurant a rather closed-in feel, dark, exclusive feel. From the moment you arrive at the restaurant, the Red staff are attentive, friendly, knowledgeable, and helpful. From the parking valet, to the hostess, to the servers and bus boys (though I’m sure there’s a fancier name for them at an establishment like Red), each person seems to make it his/her job to ensure your visit is perfect. Our meal started simply with salads all around. I ordered the Red House salad, which is your standard mixed greens salad spiced up with golden raisins, amaretto almonds, and potato gaufrettes with a sherry vinaigrette. While realistically the description probably sounds fancier than it really is, Red does a perfectly fine job of presenting a tasty salad with something a little out of the ordinary — in this case the waffled potatoes on top. Across the table from me, I’m told the Caesar salad was terrific with a delicious dressing, fresh lettuce, and real shaved parmesan. And then it was time for the main event: steak. The seafood may be good; the pasta may be wonderful; but don’t waste your money if none of you are in the mood for real red meat. What makes a Red steak more “real” than at Max & Erma’s? Well, for starters, it has to do with the fact that when you order a steak medium-rare it actually comes out red hot in the middle as opposed to well...well-done. Across the table from me was another happy camper, who ordered the 7 oz. filet mignon with a side of grilled sweet potatoes, which were also fantastic. And even better was our company sitting at the other corner, who ordered the surf & turf — a 7 oz. filet with an 8 oz. lobster tail — and, poor us, couldn’t finish the lobster. So, I insisted I could help. The lobster was fantastic. The meat was soft and sweet even without the candle-lit melted butter. Oh wait, did I say the steaks were the main event? My mis-steak (sorry, had to). We actually first heard Red recommended to us by friends who stop by frequently just for dessert. So, despite how filling the steaks and salads were, we were not about to stop there. Our table ordered two desserts: the caramel creme brulee and the “molten chocolate decadence” — as if we would ever turn down a name like that. I’m told the creme brulee was wonderful, and it was certainly presented creatively in a long narrow boat. But the chocolate cake was the real story. Though the portion was sadly designed for only one to maybe two people, the chocolate was rich and smooth; the berries were fresh; and the mouse accompaniment was sweet and silky. Yes, our friends were right: we may not be able to afford a Red steak every week, but we definitely can’t afford going too long without such a grand chocolate conclusion! Having walked through Hyde Park Square somewhere around zillions of times, we knew we wanted to try Red eventually, but it’s not exactly the type of place you just go when you’re hungry. Once we had the right occasion, we made reservations and headed out on a Saturday night. From the moment you pull up to the valet parking in the square, you know it’s an upscale restaurant, and the staff inside makes sure you don’t forget. They seem to be everywhere, ready to take you to your table, pull out (and push in) your chair behind you, take your coat to the coat check, and hand you menus. I think these tasks were, in fact, done by four different people. They told us they specialized in steaks and wine, and based on the number of times they tried to convince our table to try wine, they were disappointed when we did not order any. Three of the four of us did order steaks, however, so hopefully that was consolation enough. A word for vegetarians (those who decide a steakhouse is a good idea): the menu online looks like it will have lots of options. However, we were told when the waiter came to tell us about specials that they did not have the ravioli, tortellini, or gnocchi. In other words, vegetarians were out of luck. There was one more veggie item on the menu, an artichoke sandwich of some kind, but it seems so insignificant next to a steak! I ordered fish. The bread was decent, two different kinds of rolls, but not particularly notable. The meals all come with salads. Three out of four of us opted for the Red House Salad: golden raisins, amaretto almonds, charred onions, mixed greens, spiced potato gaufrettes, with an aged sherry vinaigrette. (For the record, the “gaufrettes” are spicy and fancy waffle cut potato chips, and delicious.) The salad was fantastic. There was a creative mix of ingredients, and unlike many restaurants, the salad was not drowning in dressing; there was about as much as I would have put on myself. With the fancy potato chips on top, it even looked really pretty coming out of the kitchen. Report on the Caesar salad was that it was also delicious and appropriately under-dressed, with a dressing that did not feel nearly as heavy or thick as most restaurant Caesar dressings, and nice-looking, big parmesan shavings on top. After an appropriate interval (as in, not before we finished our salads or immediately upon clearing the plates), our meals arrived. I had pan seared mahi, which came with soba noodles in a soy sauce and citrus sauce. The noodles were good, but very salty, and the citrus somehow all was at the bottom of the pile, so I didn’t find it until late in the meal. The fish was good, but not particularly exciting; in addition the pan searing, there was not any discernable sauce or spice added to the fish itself. It was a good-sized portion, although the plate looked emptier than I am used to at restaurants—and not as beautifully garnished as I expected from an upscale place, but I was certainly incredibly full by the end. Not that incredibly full stops me from ordering dessert. The desserts at Red (specifically the caramelized banana bread pudding) were highly recommended by friends, so we decided to indulge. As per usual, we got the most chocolatey* thing on the menu: molten chocolate decadence. Since the desserts are described by the waiter rather than printed on a menu, I didn’t let him get all the way through the description before deciding on the chocolate lava cake. I was pleasantly surprised, of course, to find out that it also came with chocolate mousse and some fresh berries. The dessert was very good, although like once before, we were a little disappointed to find no “lava” in the middle of the cake. While it was not particularly overcooked on the edges, the center was by no means gooey, which was a bit sad. The mousse was very good, and the berries allowed us to call the whole thing healthy, of course. Overall, dinner at Red was very good. It is certainly expensive, and not a place I would go frequently. If I had another occasion, I might look for another restaurant, mainly because there are so many nice restaurants in the area, and I did not think that this one was SO amazing that I’m ready to make it my go-to fancy restaurant…but it was definitely a good one! *Microsoft Word requests a change from “most chocolatey” to “chocolatiest.” Neither of which are in the computer’s dictionary. Just for the record. 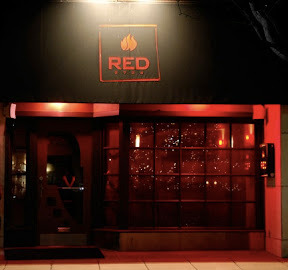 I really enjoyed Red and thought you guys nailed it by saying, good to great choice...expensive and somewhat limiting, not sure i'm choosing it for my next special occasion. Have you tried Eddie Merlot's in Montgomery? Just as good, if not better.